On behalf of the Central Otago golf clubs of Alexandra, Arrowtown, Cromwell, Queenstown, and Wanaka – we introduce you to The 2019 Mount Michael Central Otago Autumn Golf Classic. PaR nz Golfing Holidays for the 2nd year running, have been appointed promoters and directors of this very successful tournament. This is New Zealand’s largest amateur golf tournament which has proven to be extremely popular with local and international golf visitors alike, selling out within months. Entries are limited to 448 on a ‘first come’ basis. The 2019 Central Otago Autumn Golf Classic will be held from Monday 8th April to Friday 12th April 2019. The rounds of golf will be played consecutively across the various golf courses. Men and women golfers of all ages are welcome to enter. Maximum handicap index of (men 32.0 / women 36.0) apply. Tournament entry is NZD$365 pp and includes 5 rounds of golf, a ‘Drop in Wine, Beer & Cheese Welcome’ at Arrowtown GC on Sunday 7th April presented by the tournaments naming sponsor, Mount Michael Wines and Gold Sponsor Partner, Wanaka Beer Works. The final function with prize giving will be held at the Millennium Hotel, Queenstown on Friday 12th April 2019. This includes a light supper and a complimentary beer or glass of wine. This is an additional NZD$25 for players and NZD$50 for any partners. For the tournament week, we are promoting a special 6-night accommodation package at The Copthorne Hotel and Resort Queenstown Lakefront. We also have a special tournament deal with Budget Rental Car ‘pay for 5 and get 6 days rental’. New in 2019 we have created drop-in centres in Arrowtown, Cromwell, Queenstown, and Wanaka so you have a great fun meeting place for drinks and dining options with your golfing buddies! EVER seen a post-card of Queenstown? If so then it has probably been taken from the top of Skyline Gondola and has the Queenstown Golf Club in it! visiting the region. The Course is surrounded by lake Wakatipu and cradled by stunning mountain ranges so every tee and green has a view which makes it hard to keep your head down! Signature hole’s take on a whole new level at the Queenstown golf club especially the 4th, 5th, 9th, 10th, 14th and 17th which could be signature holes on any course. 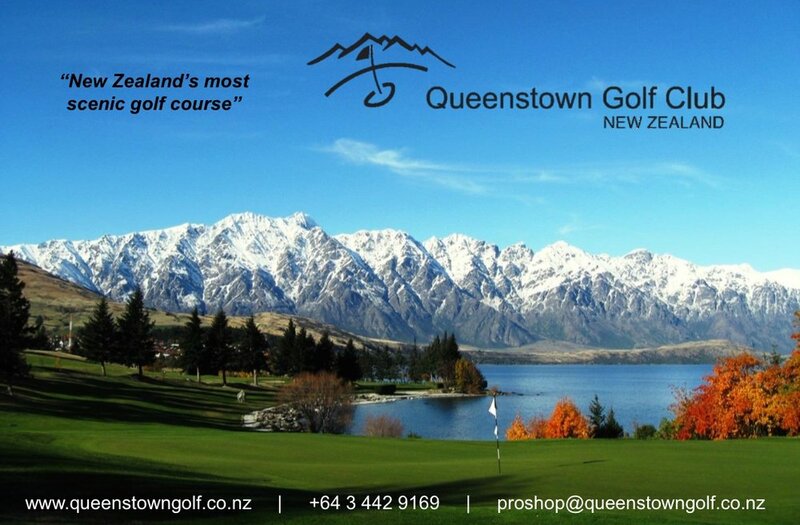 With a proud and loyal membership,Queenstown golf club has a long history and welcomes visitors year-round. Equippedwith 36 modern motorised carts, a PGA Professional, Pro shop, 7 day a week Café specialising in home-made faire and fully licenced Bar ensures all your golfing needs are met and exceeded. The signature hole and probably one of the more scenic photographs on a New Zealand golf course would be the par 4 5th that curves left around the shoreline of Lake Wakatipu to an elevated green. Driving line is key as an over aggressive line combined with a miss-timed drive will see you ending up in the drink,however, the hole sets up for a right to left shaped drive which will carve yardage off yourapproach shot. The facilities are excellent, carts and club hire available from the pro shop. Green fees range from $60-95 depending on seasons. A short 50-minute scenic drive from Queenstown, the township of Wanaka is a stunning and tranquil holiday destination in the heart of the Queenstown Lakes region. Perched above the picturesque township is the lovely Wanaka golf club; the biggest club in Otago and Southland with over1000 members. Host to the NZ Mixed foursomes in 2017, the NZ Women’s Seniors in 2012 and Men’s in 2009, Wanaka Golf Club boasts a well maintained, charming and challenging layout, with great value for money. Measuring 5770m (blues) and 5496m (whites) the course isn’t long by modern standards, but careful course management and the ability to shape your shots is important if you want to score well. The small greens and natural contours of the land also present their own challenge, so playing safe to the middle of the greens is recommended. It’s also important to try and keep your eye on the ball, as the spectacular views across the town and lake to Mount Aspiring National Park are some of the best in New Zealand, and can certainly add an extra distraction to your game. The two nines are very different. The front-nine, which was established in the 1930s, features an undulating layout with small greens nestled amongst the rolling terrain. The back nine, which was added across the road in 1967, is much longer and slightly flatter—but no less spectacular. The club has progressed significantly in the past decade with capital improvements and course upgrades, making it one of the most scenic and playable courses around. The club features all the usual facilities you’d expect from a quality golf club, including club and cart hire, fully-stocked pro shop, driving range and a café and bar. At just over an hour drive from Queenstown and Wanaka the golf course and this unique area are well worth a visit. Come and see what we mean, phone SubPar golf shop at 03 448 8374 or email SubPar@xtra.co.nz to book a tee time now. Green fees are $35 for NZ affiliated players with group discounts available. The Cromwell Golf Course is a sand based, links style course located further from the sea than any other in New Zealand. Its fairways follow the natural lie of the land and features a sandy, wasteland feel, rough with patches of marram grass and large undulating greens. The course has 5 tee locations ranging from beginner to championship providing a real challenge for all levels of golfer and was rated inside the top 30 NZ courses in NZ Golf Magazine’s 2019 rankings. The Cromwell course hosts the New Zealand Open final qualifying event annually. Course facilities include a full length driving range and large multi-tier putting and chipping green, on-site PGA Professional, fully stocked pro-shop along with electric cart, trundle, and club hire. Situated on the 45th parallel, the inland location and surrounding mountains creates a microclimate nearing semi-arid. With less than 400mm (<15 inches) of evenly spread rain and 2200 hours of sunshine per year, golf can be played comfortably year-round with dry underfoot conditions. In winter a crisp white frost usually ensures a brilliantly sunny day in which to enjoy a round of golf on a course maintained to a consistently high standard. The golf course is in the centre of the town, which in turn is surrounded by vine yards and orchards. This is the centre of the world renown Central Otago Pinot Noir producing locations of Bannockburn, Bendigo and Lowburn so wine tasting opportunities are numerous. The town is also located adjacent to Lake Dunstan and the junction of the Clutha and Kawarau Rivers. Arrowtown golf club is the jewel in the crown literally as it sits below the Crown Range and runs alongside the famous Arrow river which over 100 years ago was once a hive of activity during the gold rush era. The course borders the outskirts of Arrowtown which is about 20km from the centre of Queenstown and offers stunning views of some well known ski fields, the Remarkables and Coronet Peak. If you are lucky enough to play on this hidden gem then you’ll will no doubt be blown away by the unique layout of the course as the narrow rolling fairways weave their way through valleys and rocky pillars very much like Roxburgh golf club. In the summertime the Browntop grass in the long rough is left to seed, leaving a colour scheme that represents a truly natural setting and makes the course look like a postcard. In 2012 the course won the New Zealand Golf Course Superintendants Association (NZGCSA) Environment award which recognises New Zealand’s leading golf course in relation to their environmental management practices. The club under took the removal of wilding trees and broom, while re-establishing Matagouri amongst the schist rock outcrops. From a playability perspective, the course is the shortest out of the top 5 but probably requires the most accuracy from tee to greens. Again like Wanaka, Roxburgh and North Otago, the greens are very small. However for any big hitters, there are a lot of risk and reward holes that can provide a lot of birdies but also double bogeys and beyond. One of the best holes is the 18th which requires a blind shot over a hill to a fairway that slopes to the left towards a pond. A good drive leaves only a wedge shot to the green and a good birdie opportunity however getting a good drive away is the key. Club hire is available and green fees are $50.00 for NZ Affiliated and $95.00 for Non Affiliated.